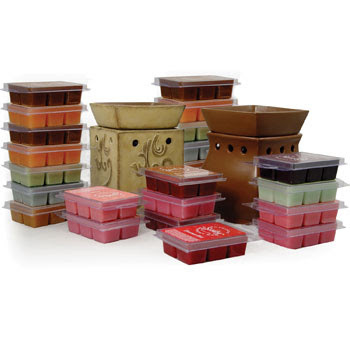 Scentsyis a fairly new company founded in 2004 who are the makers of candles that are leadless, wickless, flameless and smokeless in over 80 exclusive scents. This company saw the need for a safe alternative to burning candles and seeing the devastation house fires can cause from your typical candle. 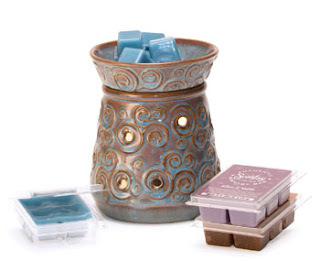 Scentsy’s wickless candles are highly scented bars of wax called “Scentsy bars” that melt at a very low temperature of a 25 watt light bulb in exclusive electric warmers. Because they use no open flame like a standard scented candle, they pose no risk to children, pets or property when used properly. This sounds so unique to me and I had never heard of anything like this candle before! Scentsy is only available in the US which would make sense why I hadn’t heard of it. I hope they come to Canada one day so I can try it out for myself. Trista Jensen has been selling Scentsy since September 2008 and she currently sponsors 19 girls from all over the US. For anyone who would like to join her Scentsy team, she gives out a free warmer to all her new consultants. Anyone placing an order with Trista online, she will send you out a free car candle and if your order is over $40, you will receive a free scent bar of your choice. My name’s Trista Jensen, I’m 35 years old and just moved to Idaho from California six months ago! I have a 15 year old daughter, Nechelle and a 15 month old baby girl, Madison. I work for Fox Studios in California remotely as a Sr. Business Analyst in their IT department. I hadn’t heard of Scentsy until I moved here to Idaho and everyone had it. I was a big yankee candle fan until I realized how much money I was spending trying to put one in every room and as soon as the candle got halfway down.. I noticed it didn’t smell anymore! I threw out all my candles and have gone totally wickless with Scentsy! The wax is warmed just above body temperature, so even if my little one put her finger in it, it wouldn’t burn her. It’s a paraffin wax so it just peels right off. 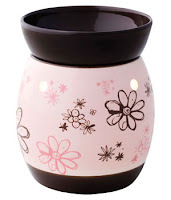 Trista would like to give one of my readers a Scentsy System which is a warmer and three scent bars of your choice.